Behind the scenes marketing - it sounds exclusive, it has a Hollywood air about it and it's a way of working what you've already got, for no extra cost. Behind the scenes content marketing has been around a long time. It invites people to peek into the shadows and promises them a glimpse of what's really going on. Though the term itself conjures up images of film sets and theatrical stages, behind the scenes marketing was first used ages ago. Like early 20th-century ages ago, when advertising pioneer Claude Hopkins designed a campaign for Schlitz beer. 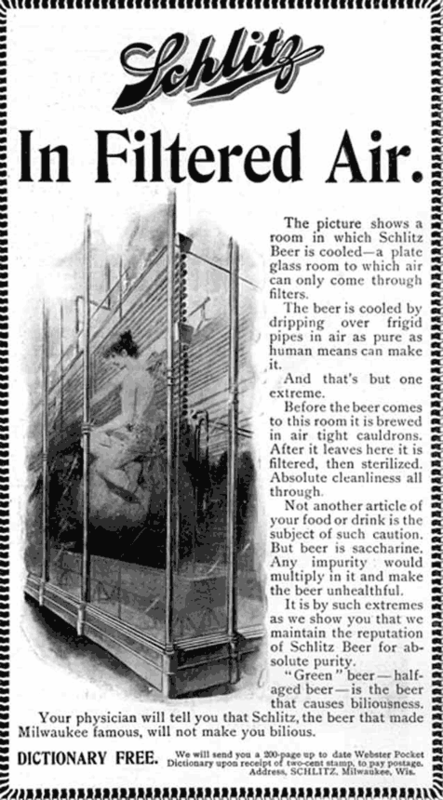 At the time the fad was to pitch your beer as 'pure' so, rather than just claim Schlitz made pure beer, Hopkins showed his working with print ads that explained the brewing process. Now, over 100 years later, behind the scenes marketing has taken on many forms and given us all a cheeky sneak peek into the real lives behind the businesses we know. A lot of these organisations do the usual 'here's us working/talking to clients/having a biscuit break', but these are a few of my favourite examples of people taking the 'behind the scenes' concept to the next level. Behind the scenes videos have become a staple of Hollywood productions. They can result in videos that show how iconic scenes look in real life, clips of big name celebrities at work and insights into how much work goes into creating just one shot (plus you never know if what you happen to catch can become the next Hearts of Darkness: A Filmmaker's Apocalypse). No movie franchise knows how to do behind the scenes better than Lord Of The Rings. While creating six films (Hobbit triology included here guys) they managed to take hundreds of photos, create a documentary and capture staff pranks. The most famous of these behind the scenes moments, however, came from the set of The Hobbit. While Peter Jackson and his crew were now used to ignoring the camera operators floating around, Martin Freeman - the new star of the film - found his own way of reacting to it. He gave them the middle finger. Not just once either; he did it every time he was caught on camera. What started out as a joke between Freeman and the cameraman quickly became an internet hit after a compilation of all these shots was put together. It was a funny, interesting and a refreshingly 'off brand' set of footage for the pretty serious family-friendly film. StartUp, a podcast created by radio producer Alex Blumberg (best known for his work on This American Life and Planet Money), is so behind the scenes it's meta. When Blumberg decided to leave his life in public radio and create his own podcasting company, he did what comes naturally to him and documented the whole thing. The result was the first series of StartUp - a podcast about starting up a podcast start up. It might seem complicated but the beauty of StartUp was its simplicity and honesty. This wasn't a case of a creator recording his journey and only sharing it as a 'success story' after he got to the end. It was created and shared with the world in real time, so listeners didn't know week-to-week what would happen to the company or if Blumberg would secure enough funding and support to fulfill his dream. Not only was this behind the scenes look into starting a new business extremely successful (in the first few months StartUp was attracting roughly a million listens a month) it became the ultimate example of humanising a brand. Blumberg didn't just share the steps he took to start his business - create a plan, meet investors, perfect the pitch - he shared the stress, struggles, and joy that came with it. You couldn't help but feel for him as you heard, in excruciating detail, his failures (particularly when he fumbles through his first pitch to a powerful investor) and his successes. It was strong storytelling that packed an emotional punch and, because of this, you felt invested in his company yourself. You wanted it to succeed, not because someone told you that you should care but because you actually did. It was also a stark reminder that companies aren't always faceless monoliths but collections of people with their own aims, ambitions, and tales to tell. Instagram is the perfect place to practice behind the scenes marketing. It's an easy place to connect with people using images and its filters mean that even the photographically challenged can make their shots look half decent. Committing to posting a few pictures each week can give potential clients the chance to see the people, processes and projects that make up your organisation. General Electric, however, have perfected the art of Instagram with a feed that pairs behind the scenes with stunning images and insights into staff members. They've found a way to take what could potentially be a dry topic for some people (engineering) and made it a) beautiful - with artistic shots of intricate machinery and b) human - with in-action staff shots and mini-interviews with employees.